I can not believe that the Chicago Marathon is less than a month away. Eeek! I’m so excited and a bit nervous about race day. But mostly excited and in disbelief about how soon it’s coming. 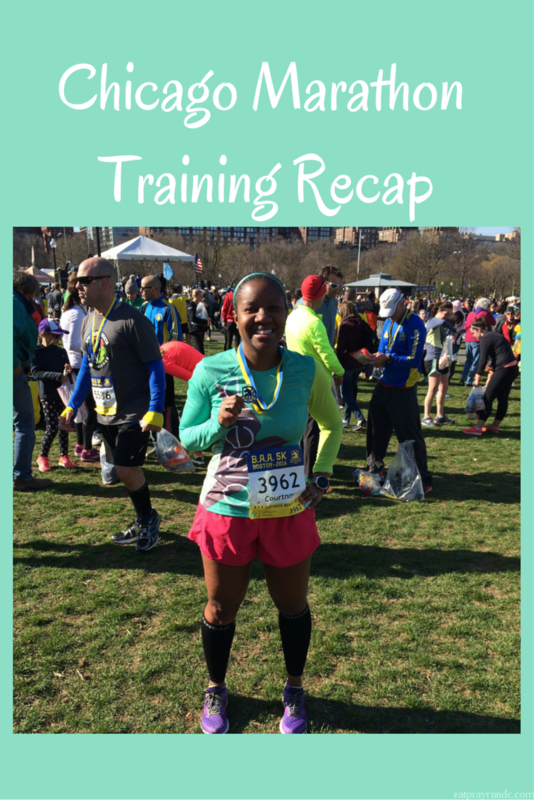 Each week during this training cycle, as I train for the Chicago Marathon, I will share how my training went and what the week looked like. I do this because: 1) I love reading about how other folks train and 2) it’s great for me to have a record of what I did each week. Also, honestly, it helps keep me accountable when I know I’ll be writing about it. I also post almost all of my runs on Instagram as well. A few weeks ago, I started a link up for Chicago Marathon Training Recaps – I know there are more of us out there so please do link up! I love reading about folks training for the same race as I am, so please do link up! Monday: Five miles after returning from Vegas at about 2am. Not very fun but I got it done. Tuesday: 2×3 mile repeats plus a warm up and cool down mile. Eight miles total and my legs were TOAST! Wednesday: REST DAY IS THE BEST DAY. That is all. Thursday: Nine tempo miles – this was a really tough run. My legs were TIRED, I was tired and I just wanted to get it over with. Friday: I headed to Minnesota for another Bird Camp (a full camp recap is forthcoming)! I spent four days in glorious weather and kicked it off with an easy three once we arrived. Saturday: Four and a half miles at camp with my gals! A fun little adventure run. Sunday: Long run day at Bird Camp. Oh man- this was the best 16 mile run. The weather was perfect, the setting was gorgeous and I had friends right by my side. I honestly felt like I could’ve run forever It was just so gorgeous. Have you ever been to an adult running camp? I highly recommend it! Your bird camp photos look amazing! it was amazing – had the BEST time!! I want a big, beautiful lake to do my ice baths in! Somehow I don’t think standing in Tidal Basin after a 16 miler would quite be the same. That’s some pretty amazing mileage with all that traveling! Congratulations on a great week!!! It’s so crazy to me how fast this race has snuck up. Your training has gone so well and I’m excited to see how the race goes for you too. Haha, rest day is the best day! 100% agree!!! I bet those cooler temps in Minnesota felt fabulous. What a great way to inject some confidence into your running. It’s been fun following your training. You have been doing great! Thanks Wendy! The cooler weather was a total gift! Another awesome week! You are consistently putting in really great runs week after week. You are going to have a great race! So cool you got to run in a pretty setting with friends for your long run. I love that picture of you at the bottom–you look strong and happy! I would love to go to an adult running camp. You are rocking your training !